Do you know that there is a way to write SEO optimized articles while be engaging for readers at the same time? The growing popularity of SEO has released some urgency in optimizing the content of your website. Techniques and recommendations are born, targeted to this sole purpose. Some plugins I recommend you to use are Yoast, All in One SEO or Delucks WordPress SEO. However, writing for search engines (which gives a clear benefit to your business), may let you lose sight of the primary goal of a blog: to involve the reader. Of course, riding the wave of SERP allows large volumes of traffic, but this is not what keeps users glued to the screen reading your content. Here’s how to write SEO optimized blog posts, and still be engaging. In other words, how to achieve the perfect balance between optimization and appealing. If you want to do things right, it makes sense to start from the foundation. What is the first step of writing an article of success? Of course, choosing the right topic. This is the heart of the copywriting, the principle on which the entire article rests. Ask yourself what are the most interesting topics of the moment in your niche and create a post based on them. To do that, be sure to constantly stay updated on news, events and your industry trends (you can set alerts on Google Trends, based on your keywords). A content must be original, interesting and useful. Thus able to respond to a need of the users and to involve them to the end. Keywords are the neurons of SEO. When you write on your blog, it is important to select the most relevant keywords and target them wisely. To choose the right keywords you have to think like a user. What would you type into search engines to reach that particular content? You can get help by using tools such as Google AdWords (Keyword Planner), from which you can get the search volume for each keyword. Choose one or two keywords per article. Not more. Adding an exaggerated volume of keywords in a single post is a serious error, because you can’t use them all. Search engines penalize the content that contains too many reps and having at most two keywords helps to make a most fluent reading. Better if the keywords in question are long-tail, in other words, multiple-word. This way will be more effective and precise, drawing on your blog a public inclined to stay longer to read the article. Do you need to an easy to use tool to find long-tail keywords? Try Long-Tail PRO (read my full guide here). The title reflects the essence of the article and, therefore, requires the exact same treatment to content. If you want to write SEO articles and be engaging, the same characteristics must be present in the title. Make sure that it contains the main keyword (it is important), and that is not too long (most search engines use a maximum of 60 chars for the title). It must also have a persuasive value, and touch the right chord with the reader. Look for a mix between the two aspects, helping with punctuation. For example, for an article about Twitter Chat, you can choose “Twitter Chat : a Complete Guide for a Powerful Marketing Tool “. As the title, the introduction of an article has a life of its own. From the standpoint of SEO, it is important because it is one of the parts where it is useful to include your keyword, possibly at the beginning (first sentence). The introduction of an article plays a very appreciated service to your readers, giving them the opportunity to have a preview of the argument discussed in the text that follows. So, it is important to summarize the article objective in these few lines. For an SEO aspect and the formal quality, it is important to split your articles into short paragraphs. How short? A maximum of 50 words. Both readers and search engine spiders respond well to this structure. Not only because a single text block scares anyone (especially online, where the maximum attention of spam comes down to a matter of seconds), but also to helping the reader to flow smoothly through the content and find the most interesting parts of the text . Similarly, it is good to place subtitles to plot the text structure, which makes the post easy to navigate. From a seductive viewpoint, it is clear why you should embed images within an article. Who would have thought that they also have an SEO function? You can optimize images by entering a title and description. This will allow them to communicate with search engines. Choose only images that add value to the text. Think about the visual aspect of your article as the spring that triggers the reader’s curiosity or as the solution of the discursive part. CTA (Call To Action) means inviting your readers to take some action. Typically, it must be at the end of the article, asking users to do something like commenting or sharing the post. Also, it’s commonly used an invite to subscribe to mailing lists or RSS blog feeds. This gives purpose to the article that goes beyond the content itself. It’s like turning a drawing into a three-dimensional object. 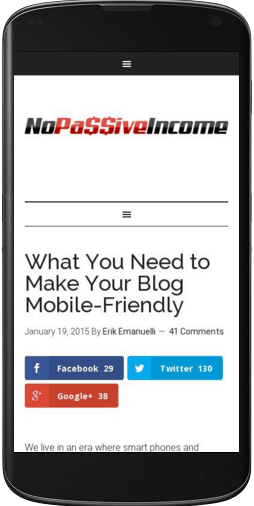 Another way to optimize for search engines while still be engaging for readers is to make your blog responsive to portable devices. Today, many users are viewing a website from a smartphone or a tablet and expect that the website is clearly visible from those devices. A different result creates a strong discomfort to the reader. In the wave of these new habits, Google is rewarding blogs that have also been optimized for mobile devices (while penalizing the ones who don’t). Although the topic can still be present, it is not easy to write evergreen articles, that search engines keep offering to users. Keep in mind, it’s hard, not impossible. Read what HubSpot has to offer about this topic. On the other hand, it is always recommended to constantly update your content, so to renew their success. Review your old posts, by adding news and up to date information. Why do offer just one article when you have a whole blog available? When you think it’s useful for your readers (and relevant to the post subject), link to an article back in your archive. These links give to the readers a set of extra resources. At the same time, they help the indexing of your website by the search engines. In this post I tried to give you some tips to help you make your content SEO optimized and at the same time, engaging for readers. What techniques are you using? Please share your suggestions in the comments below, thanks! Thanks Erik for sharing these tactics..
From past few months, I am learning about these tips, but unfortunately, i don’t know best tools for searching keywords, for creating landing pages etc.. I would be very happy if you share some best SEO plugins…. as I mentioned at beginning of this post, the most used are Yoast and All in SEO plugin. I use the second one, it’s good enough for me. Writing articles that engage more and more readers is actually a challenge. When there are already thousands of blogs are available on every single topic. But this dosen`t make that one should stop. It means that one should find a new angle to write. creating content is the most challenging part of building a profitable website. There are different solutions. Stick with the method you find most suitable. This is my first time visit on your blog, first post topic impressed me to read top to down with full hope about SEO optimized post. Very useful & needful topics for every bloggers. Each and every bloggers still struggling to give SEO optimized & user engaged content to their blogs. So i hope will helpful in some way to keep engaged content on my future post. Thanks for sharing ! Keep Sharing !! Thanks for the kind words, Karthik. All great tips – a lot of bloggers leave out some of these which can have serious consequences when it comes to getting traffic from search engines. Thanks for the complete content but I mostly recommend to write a catchy title to grab more visitors. wonderful post on writing great posts that are SEO optimized. I couldn’t agree more on the “write naturally point”. With most of the popular keywords on high competition, the use of long-tail keywords still give many opportunities to get first page on Google. Create the twisting content, included with images, video, shining graphics, cool-looking images, and powerful CTAs. Thank you for covering this for us!